Saudi Airlines Cargo Company sponsored the Saudi International golf tournament as a formal logistics partner held in Saudi Arabia for the first time with the participation of world-class golfers, taking place in King Abdullah Economic City (KEAC) at the Royal Greens Golf & Country Club, from Jan. 31 to Feb. 3 , Omar Talal Hariri Chief Executive Officer stated. 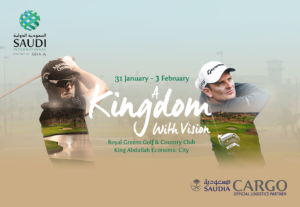 The anticipated golf tournament is the first European Tour golf event to be held in the Kingdom with the participation of elite global golf champions such as the world number one Justin Rose, world number two Brooks Koepka, world number three Dustin Johnson and the world number five Bryson Dechambeau, also joining them the four-time major champion and the 71-time worldwide winner, Ernie Els, who will make his second trip to King Abdullah Economic City after he was a part of the grand opening of the Royal Greens Golf Club in April 2018. It should be noted that Saudia Cargo always support national, cultural & sports events in the kingdom, lately the firm carried the equipment for the 33rd National Festival for Heritage and Culture (Janadriyah – 33) & it carried the cars, spares, and gadgets of the FIA Formula E Championship that occurred in the 2018 Saudia Ad Diriyah E-Prix festival, plus the firm transported the WWE championship to Jeddah.